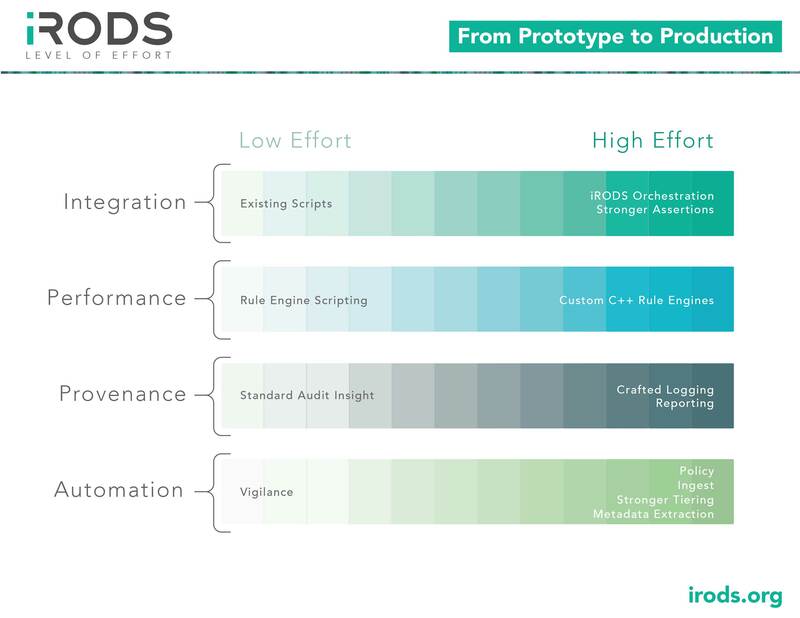 iRODS provides eight packaged capabilities, each of which can be selectively deployed and configured (usually into known patterns). These patterns and capabilities represent the most common use cases as identified by community participation and reporting. In many existing enterprise and research deployments, HPC clusters are separated from long term data storage technologies. 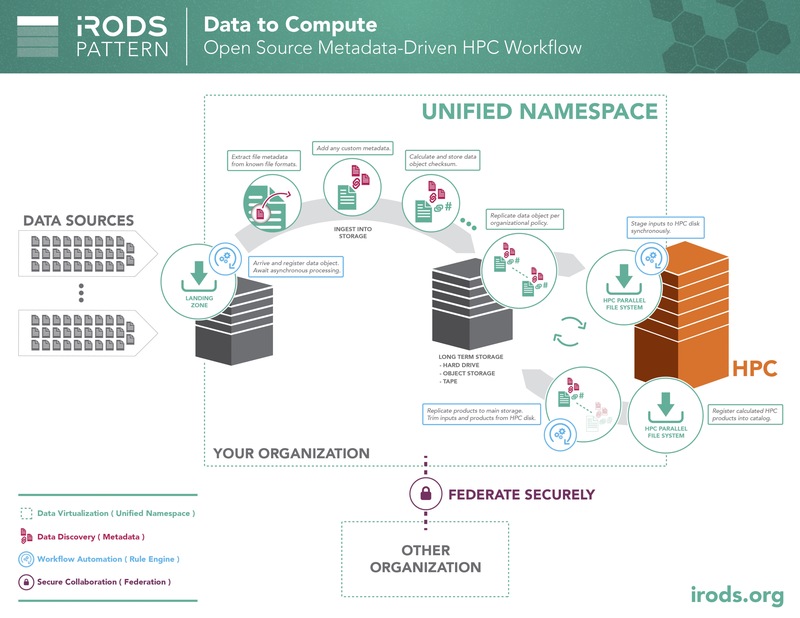 When data needs to be moved to HPC and back again, the Data to Compute design pattern can leverage metadata-driven workflows and automate the execution of an organization's data management policy. When data is stored in specific locations due to a requirement for specialized software or hardware or only because it is too big and expensive to move, compute requests can be routed to the appropriate location automatically. 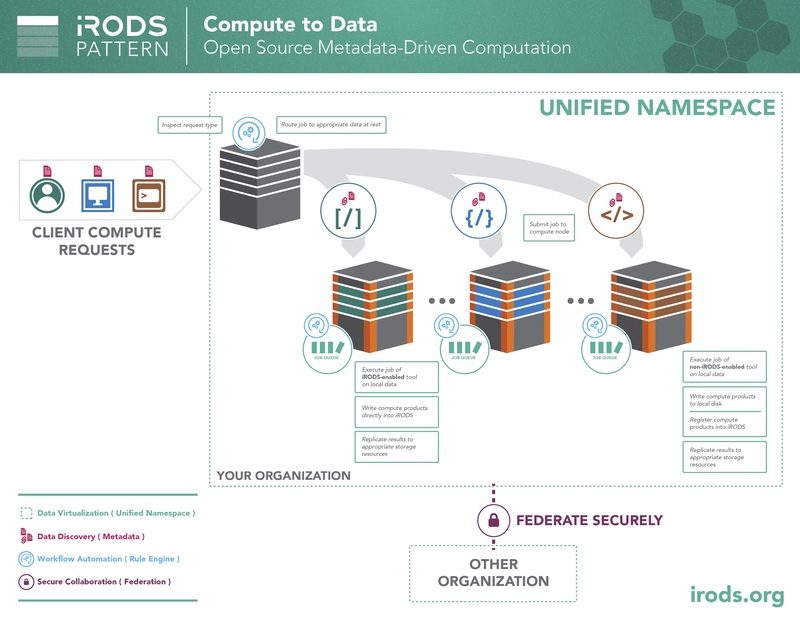 This metadata-driven computation design pattern could serve as a bridge until the time services are more fully containerized. 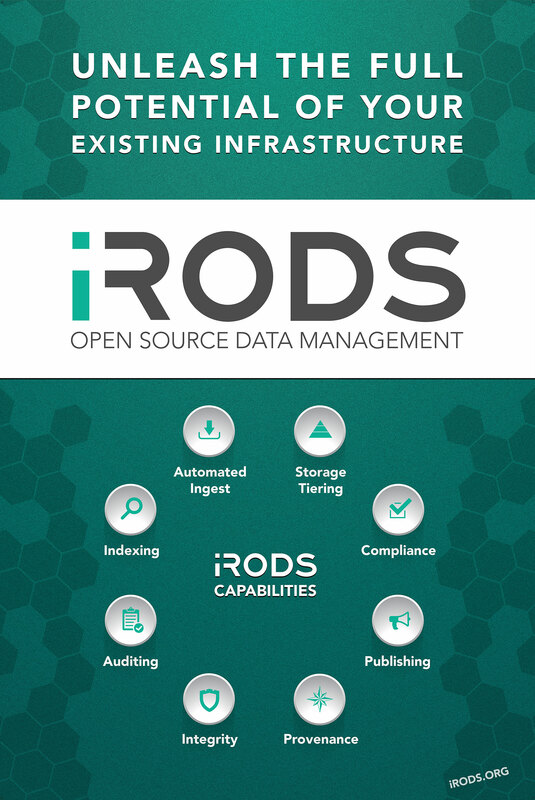 When an organization first discovers iRODS, it is usually true that the organization already has a lot of data in disparate storage systems. 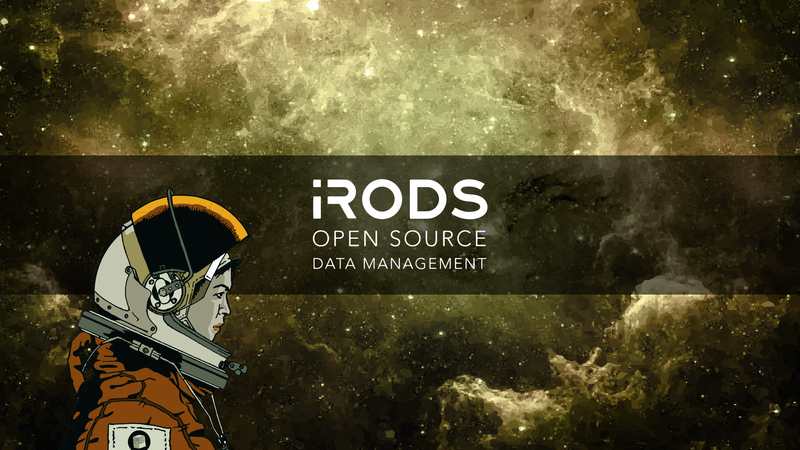 The automated ingest framework is based on RQ (Redis Queue) and can scale workers to bring large filesystems under management quickly. 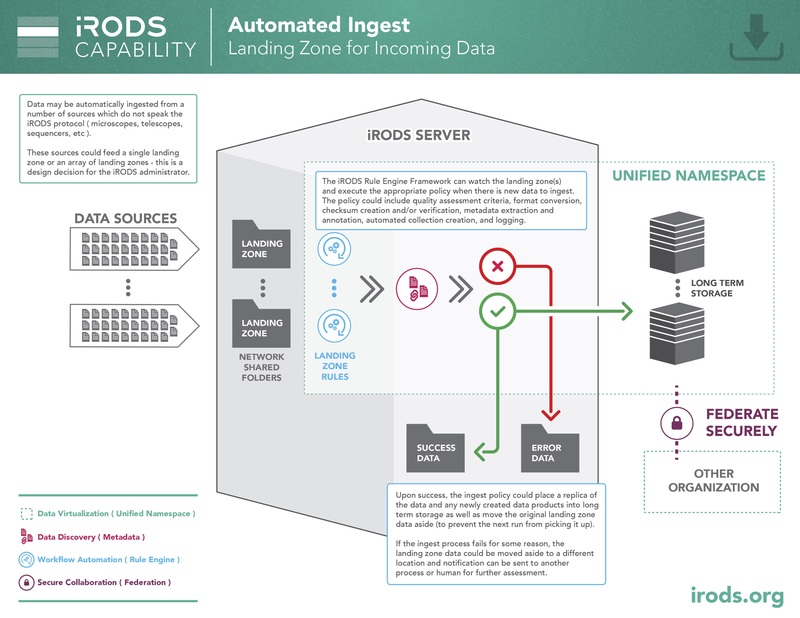 iRODS is often deployed to capture products from systems that generate new files in a regular way (sequencers, telescopes, microscopes, sensor networks, etc.). 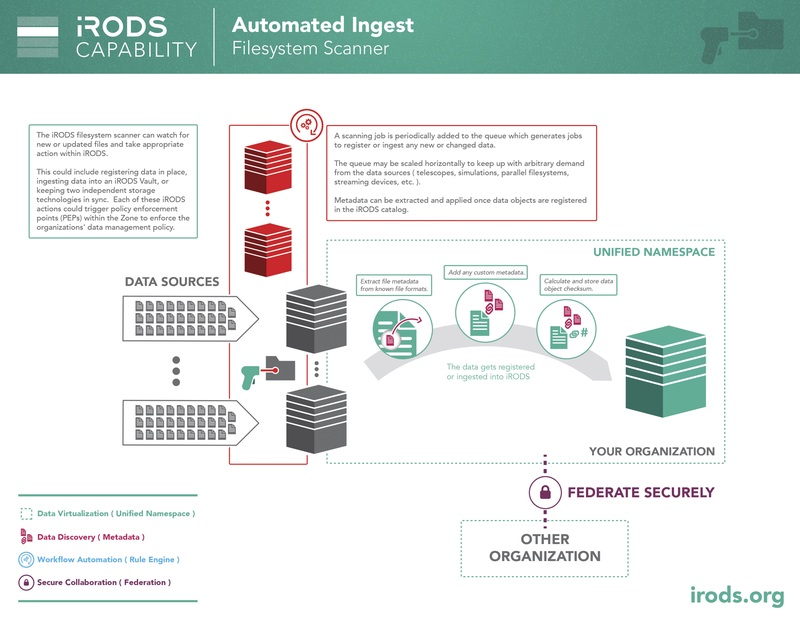 The automated ingest framework can be configured to watch locations for new files and extract metadata, define manifests, and otherwise prepare them for use by the rest of the system. 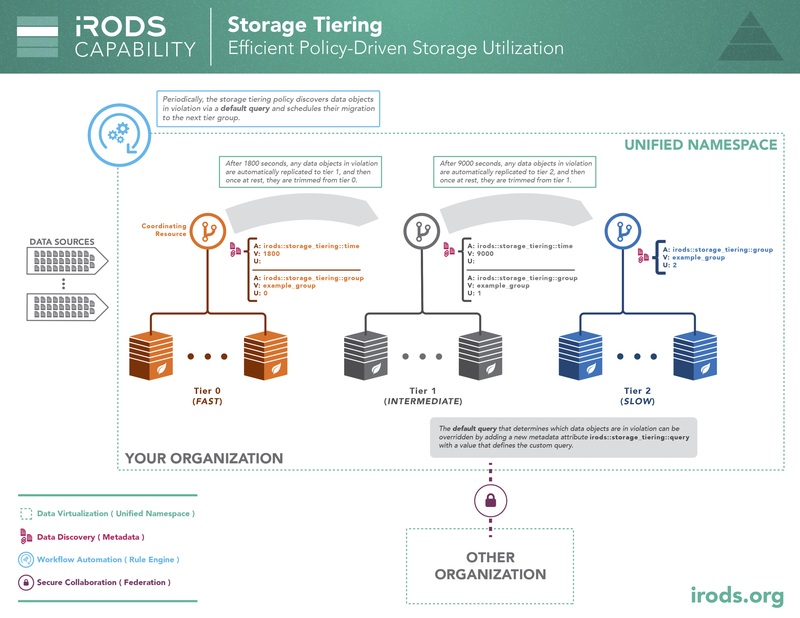 The storage tiering framework provides efficient policy-driven storage utilization by automatically moving data between any number of identified tiers of storage within a configured tiering group. To define a storage tiering group, selected storage resources are labeled with metadata which define their place in the group and how long data should reside in that tier before being migrated to the next tier. 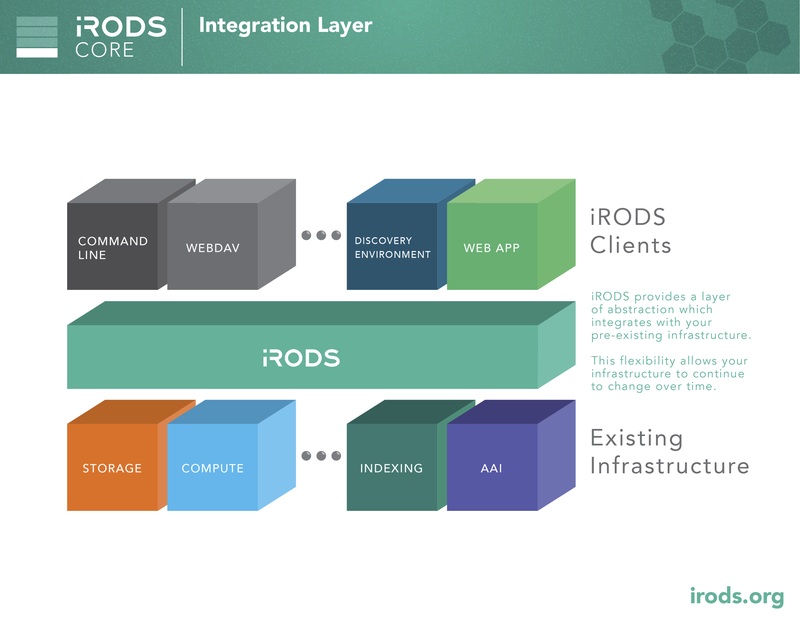 iRODS provides a layer of abstraction which integrates with your pre-existing infrastructure. This flexibility allows your infrastructure to continue to change over time. As data matures and reaches a broader community, data management policy must also evolve to meet these additional requirements. 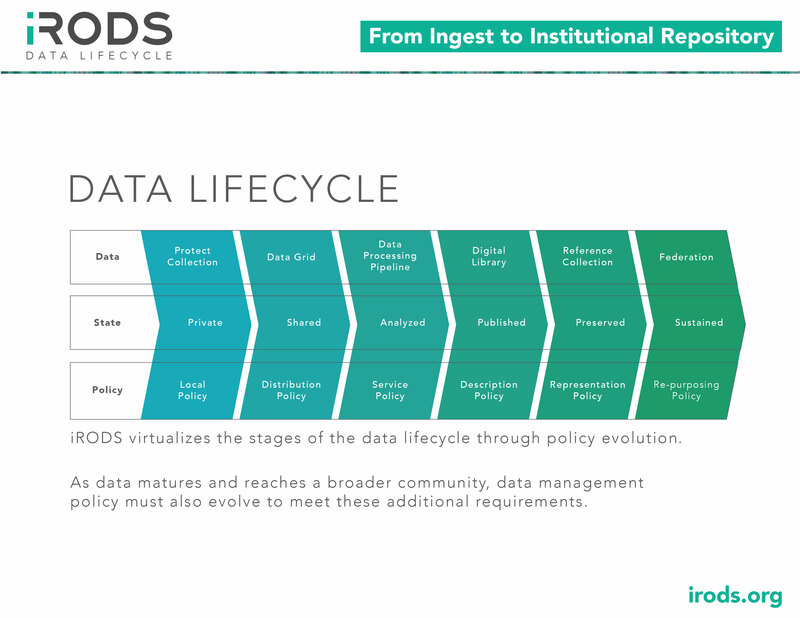 iRODS virtualizes the stages of the data lifecycle through policy evolution. 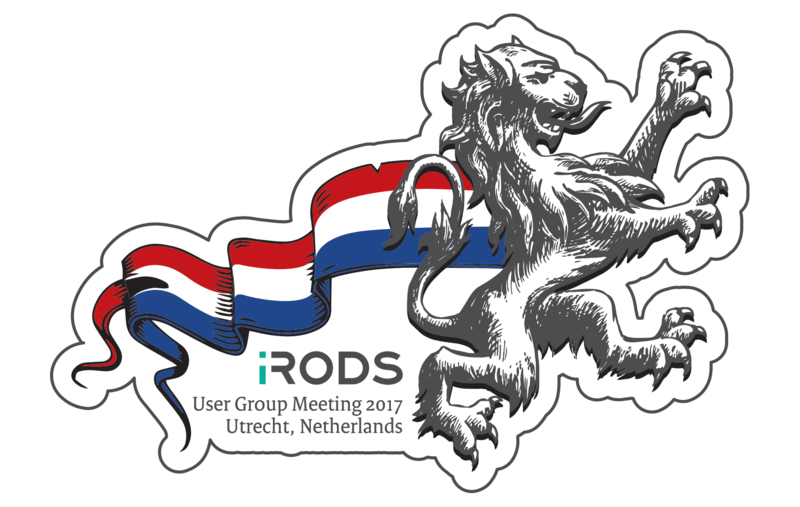 Deploying iRODS requires making decisions about how quickly and how deeply to integrate with existing systems. 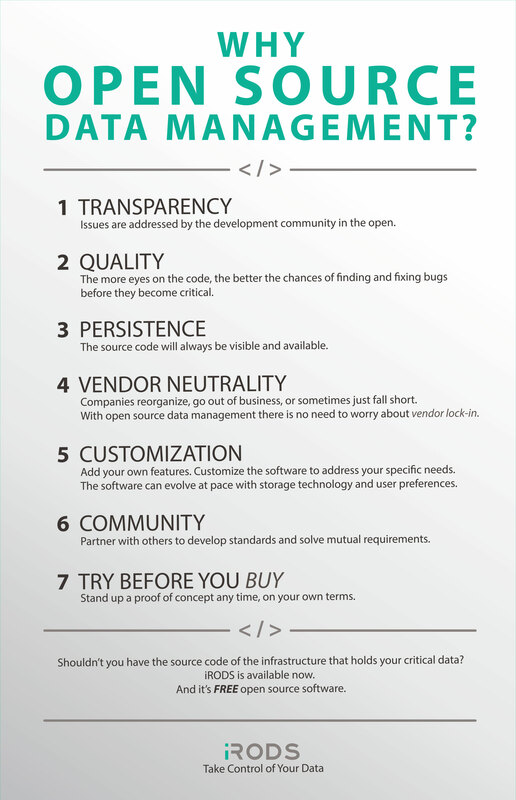 The flexibility of iRODS allows for a dynamic approach that supports building confidence and trust in the software. Tighter integration and automation can lead to better performance and stronger assertions about what has happened to your data throughout its lifecycle. 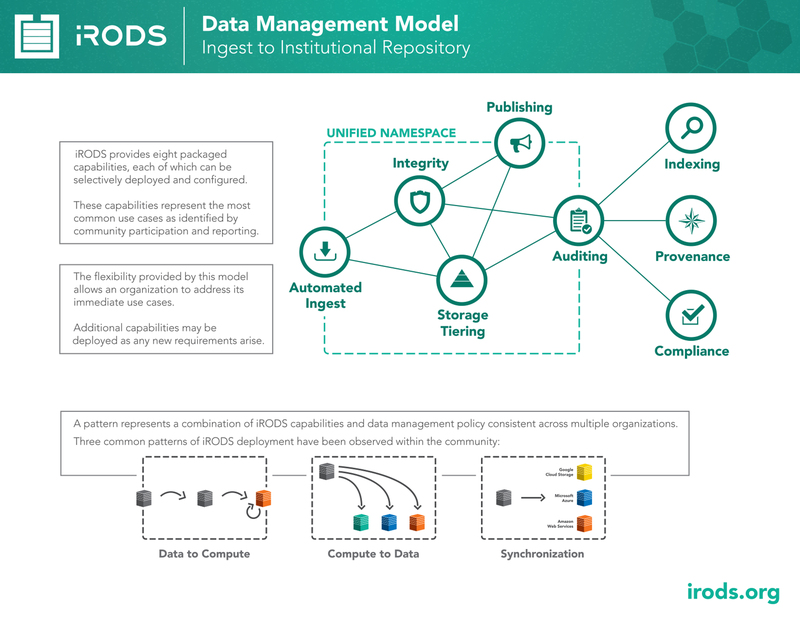 With metadata being a central part of how iRODS fosters best practices in workflows and provenance, it is also important to encourage good metadata curation. 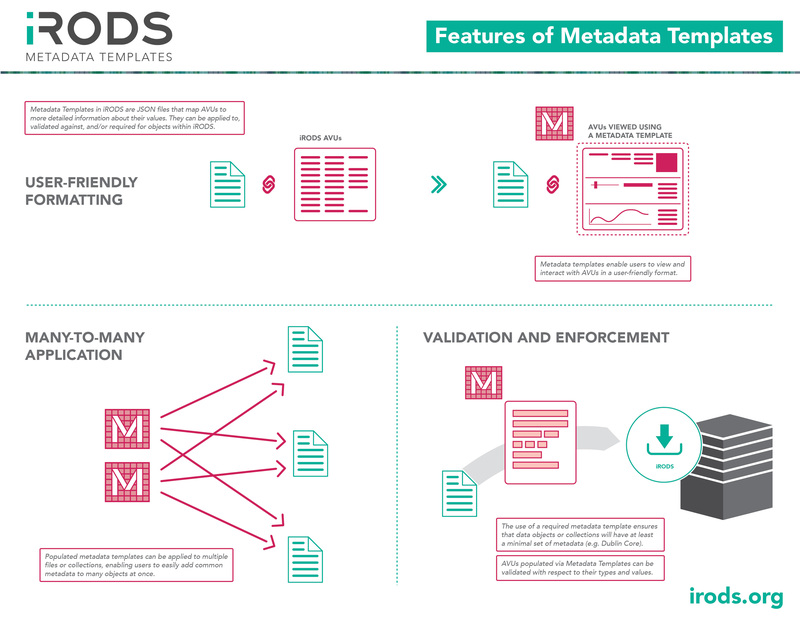 Metadata templates afford iRODS a friendly UI for specifying requirements, validation, and standardization. 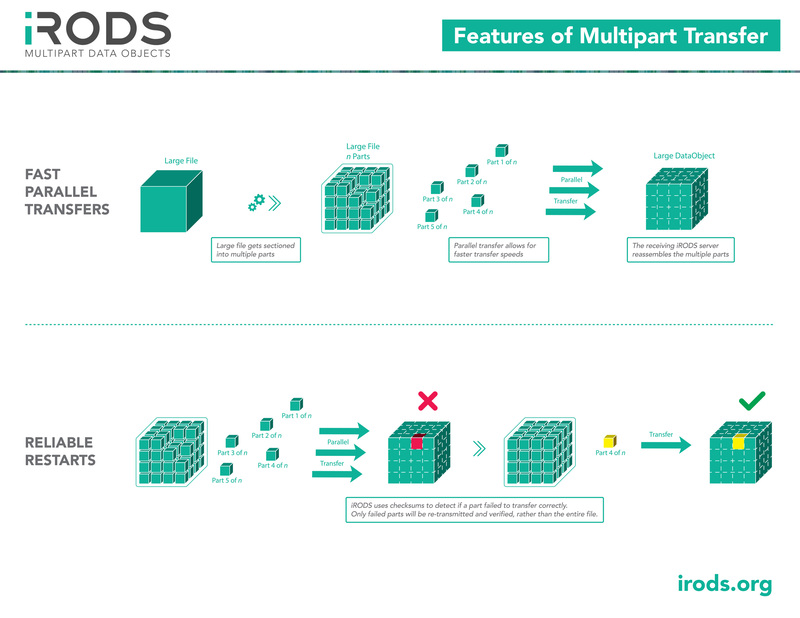 An effort to improve reliability and predictability of large file transfers in iRODS, multipart data objects will improve transport speeds (parallel and/or multisource), allow for cache-free object storage plugins, and provide natural support for reliable restarts. Set up an iRODS server in Amazon EC2. 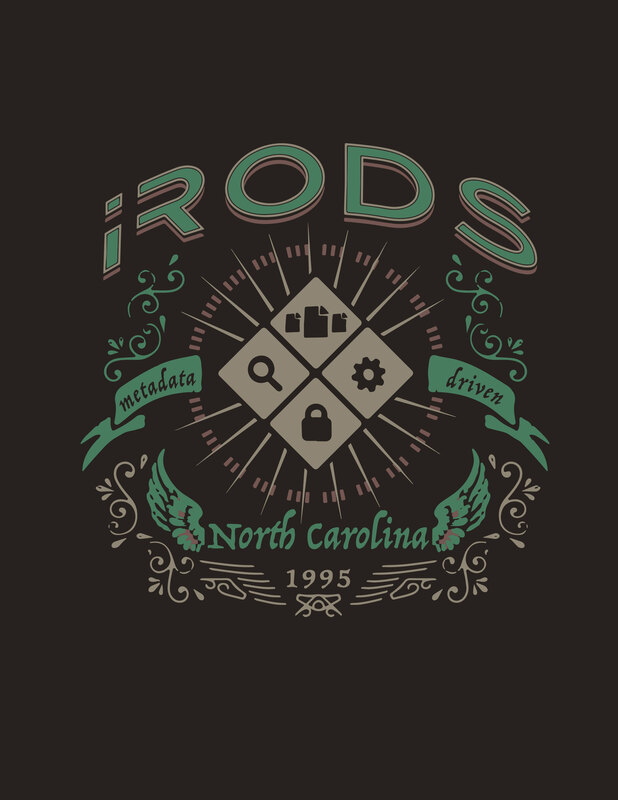 Set up an iRODS server on a virtual machine. Set up the WebDAV iRODS client for drag-and-drop file access.